Screenplay: Edgar Wright, Steven Moffat, Joe Cornish. Starring: Jamie Bell, Andy Serkis, Daniel Craig, Simon Pegg, Nick Frost, Toby Jones, Mackenzie Crook, Daniel Mays, Gad Elmaleh, Joe Starr, Kim Stengel, Sonja Fortag, Tony Curran. Herge, the writer and creator of “Tintin” apparently once said that Steven Spielberg was the only director who could truly capture his creation on the big screen. Thankfully for him then that Spielberg has got himself involved, along with visionary support in Peter Jackson. Uniting elements from Herge volumes ‘The Crab With The Golden Claws’, ‘The Secret Of The Unicorn’, and ‘Red Rackham’s Treasure’, valiant Belgian reporter Tintin (Jamie Bell), along with brainy mutt Snowy, is on the trail of a lost family fortune, involving future friend and rambunctious soak Captain Haddock (Andy Serkis). I do hope that when (or if) Indiana Jones 5 arrives that Spielberg has a better story to work with. The story here by Steven Moffat, Edgar Wright and Joe Cornish is familiar Indy fare for Spielberg but it doesn’t have enough in the tank to grab you, leaving him to stage one action set-piece after another to keep the excitement flowing. These set-pieces are undeniably exhilarating though and his handle on the animation side is entirely successful. Before him, director Robert Zemeckis tried (and failed) with similar motion-capture animated features “The Polar Express” and “Beowulf” but Spielberg and Peter Jackson have cracked it. The motion capture is flawless and every pixel of animation is refined to perfection. The problem that Zemeckis had was achieving believable and realistic eyes in his characters. That problem is now gone here. It’s so good that it’s hard to accept that real actors are responsible for the performances. 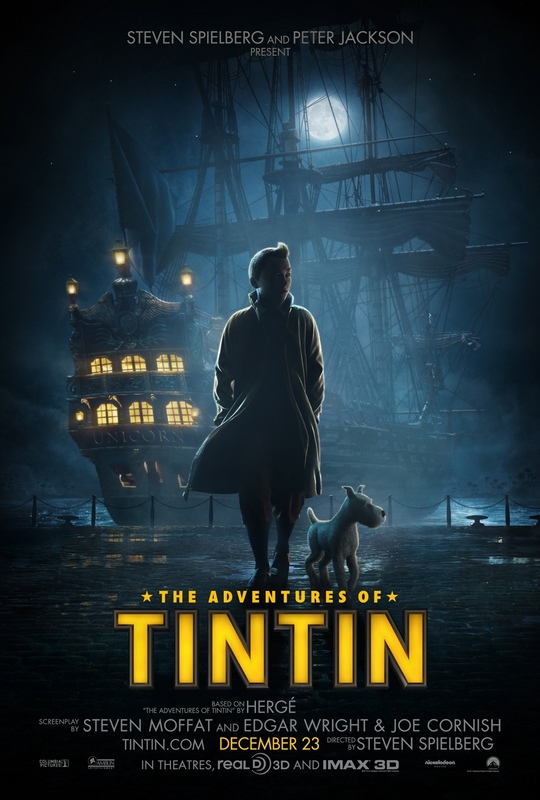 Jamie Bell is impressive as the eponymous man-boy reporter and Daniel Craig is a delight as the villain Sakharine, but the real treat here is Andy Serkis as Captain Haddock the bumbling seaman, complete with Scottish brogue and drunken mishaps. Classic boys-own adventure and the stuff that Spielberg has been churning out for years. Unfortunately, the script doesn’t hold up to the exquisite visuals and rollicking action but it’s still a treat nonetheless. This entry was posted on February 3, 2012 at 11:28 am and is filed under Action, Adventure, Animation, Family with tags 2011. You can follow any responses to this entry through the RSS 2.0 feed. You can leave a response, or trackback from your own site.